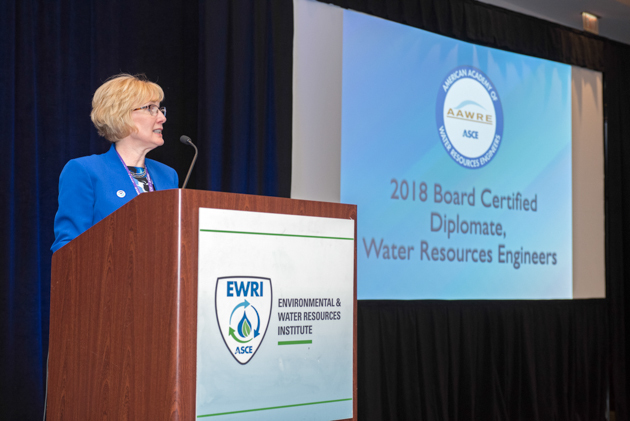 The American Academy of Water Resources Engineers (AAWRE) hosted its 14th annual Diplomates Induction ceremony at the EWRI's 2018 World Environmental & Water Resources Congress in Minneapolis on June 4. 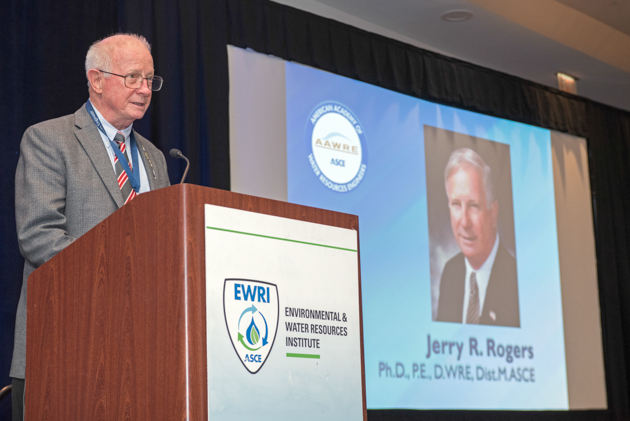 AAWRE recognized and inducted the 2018 class of board certified Diplomate, Water Resources Engineers (D.WRE) and honored the 2018 AAWRE awards recipients. The ceremony included speakers EWRI President Cristiane Queiroz Surbeck, Ph.D., P.E., ENV SP, F.EWRI, M.ASCE; ASCE President-Elect Robin A. Kemper, P.E., LEED AP, F.SEI, F.ASCE, AAWRE President Roger T. Kilgore, P.E., D.WRE, F.ASCE and AAWRE Past-President Deborah H. Lee, P.E., P.H., SES, D.WRE, M.ASCE. From L to R: Deborah Lee, Joe Manous, Rachel Ickert, Michael Buechter, Andrés Salazar, Robin Kemper, Jacob Odgaard, Jon Zufelt, Roger Kilgore, Adnan Alsaffar, Robert Ryan, Randel Dymond, Steve Starrett, Wayne Klotz, John Ramirez-Avila (accepting on behalf of Dennis Truax), Cristiane Surbeck. Photos by Robert Levy. The AAWRE hosts the AAWRE Induction ceremony annually to celebrate the new class of Diplomates, its award recipients, and also gives special recognitions to AAWRE leaders that have made significant contributions in efforts aligned with AAWRE’s mission and vision. The ceremony was sponsored by the Environmental & Water Resources Institute of ASCE and the Trinity River Authority of Texas. ASCE President-Elect Robin Kemper addressed the audience, in which Ms. Kemper provided an overview and historical context in ASCE launching the AAWRE as the pilot certification program to support professional post-licensure board certification and its significance: “AAWRE was the catalyst and the first pilot professional certification program started by ASCE in 2004 and since, there have been 3 additional professional certification programs created by ASCE. I want to personally thank all of you here, AAWRE and all the leaders through EWRI, for having the vision and creativity, in making AAWRE a successful program and the catalyst in professional certification for ASCE. Currently, ASCE’s certification programs have granted nearly 1,300 Diplomate board certifications. EWRI President Cris Surbeck and AAWRE President Roger Kilgore. To begin the ceremony portion of the evening, AAWRE President Roger Kilgore presented the 2018 AAWRE Service to the Academy Award to Jerry R. Rogers, Ph.D., P.E., D.WRE, Dist.M.ASCE for his outstanding and on-going contributions to the mission of the AAWRE. The AAWRE Service to the Academy Award was instituted by AAWRE in 2015 to recognize a Diplomate or an Honorary Diplomate that has demonstrated outstanding and extensive service or contributions to the Academy. The 2018 AAWRE Outstanding Practitioner in Water Resources Engineering Award was presented to D. Wayne Klotz, P.E., ENV SP, D.WRE, F.EWRI, Pres.09.ASCE for his significant contributions in the practice of water resources engineering and his visionary leadership in the civil engineering profession. The AAWRE Outstanding Practitioner in Water Resources Engineering Award was established in 2014 to recognize a Diplomate, Water Resources Engineer (D.WRE) who has demonstrated a significant contribution to the engineering practice based on either a single outstanding achievement or through a body of work related to the practice of environmental or water resources engineering. Both Rogers and Klotz were presented with the award plaques by Robin Kemper and AAWRE President-Elect Joe Manous, Jr., Ph.D., P.E., D.WRE, F.EWRI, F.ASCE. AAWRE founding member Jerry Rogers and AAWRE Past-President Deborah Lee. For the Diplomate induction portion of the ceremony, AAWRE Past-President Deborah Lee performed the roll call, as Kilgore and Manous awarded each of the new inductees with certificates and lapel pins. All new inductees got an opportunity to take personal pictures with Kemper and Kilgore. Debra L. Burris, P.E., L.S., BCEE, D.WRE, M.ASCE – DDB Engineering, Inc.
David Dzombak, Ph.D., P.E., D.WRE, NAE, F.ASCE – Carnegie Mellon Univ. Anthony L. Fernandes, P.E., D.WRE – Aqua Pennsylvania, Inc.
Dennis Truax, Ph.D., P.E., BCEE, D.WRE, F.ASCE – Mississippi State Univ. AAWRE also recognized AAWRE At-Large Trustee D. Phil Turnipseed, P.E., D.WRE, M.ASCE and Past-President Lee for their leadership and service on the AAWRE Board of Trustees. Phil served on the AAWRE Board from 2014 thru May 2018 and Deborah is serving her current term since 2015, serving as AAWRE President in 2016-2017. Deborah previously served on the AAWRE Board from 2010-2013. The ceremony was followed by a reception for all in attendance- as families and colleagues congratulated the new Diplomates. AAWRE plans to host the next annual Induction ceremony in Pittsburgh during the special EWRI 20th Anniversary World Environmental & Water Resources Congress in May 2019.